Download it for free at the bottom of this page. MAsha is a girl who is equally as tired as she is adorable ... and she is at that age when children do not know how to stand. 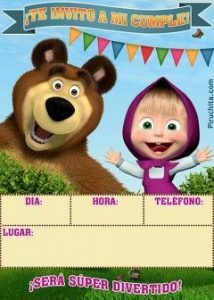 Surely you have lived some experience like this with your children, that if they know it, they will want this Birthday invitation from Masha and the Bear to print completely for free in digital format that you can also use to send by Whatsapp. 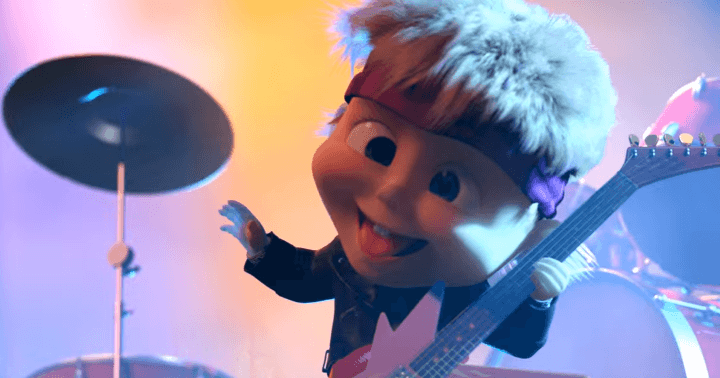 We have started to see Masha very recently in Spain on TV and you start to see something of it, but there is still very little available, while in many other countries it has been a complete success, in fact, the version that Gael sees. on the tablet is the dubbed in Latin, with a tremendously sweet voice. The cartoon series of Masha and the Bear is originally from Russia and exists from the 2009. It already has 3 seasons and has a total of 63 chapters to date. Masha is a girl of 4 years, in full age to play without stopping for a second. He lives in the forest where his little friends the animals shun him because they tend to be victims of their mischief while they play. One day, when her friends were more hidden, a Butterfly crossed her face. His peculiar laugh entered her and he began to chase her, ending without realizing in front of a house that caught his attention. The house, of course, is Bear, which had left a moment and had left empty. Masha, as well naughty and very curious that is, began to play making a big mess throughout the house. When Bear returns he finds her in full action and tries to get rid of her without success, despite trying by all means, until finally giving in and becoming good friends. Bear, is aware that she is small and is not afraid of anything, so it is usually very imprudent, so assuming a protective role, Bear is constantly monitoring what occurrences Masha has every day and does everything possible to protect her, being he who normally pays the broken plates or becomes the victim of mischief. 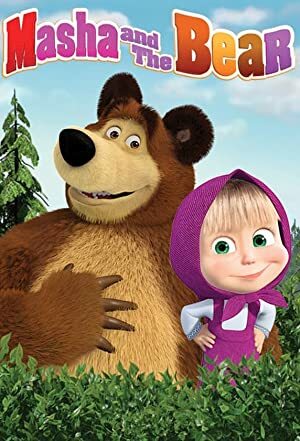 But not all episodes are like that, and that is that Masha is not only naughty and reckless, she is also very brave, generous (although sometimes she eats all sweets) and very smart, more than she seems, and she also ends up caring a lot of Bear, especially when it's about love towards Osa. Bear, it's the opposite of Masha. He has already worked for many years in a circus, he is retired and he just wanted a quiet and solitary life cultivating his garden, fishing, and trying to connect to a Osa in the area. With the arrival of Masha, everything turns upside down, but Bear loves her very much and will do everything to make her happy and protect her. Removing from the momentary appearances of Papa Noél and Dasha, the rest of the characters are all animals. In Masha's house there is a pig, a goat and a dog next to some chickens, who hide quickly as soon as they hear Masha's voice in the distance. There is also Osa, to whom he tries to dazzle Bear, and there is also another Bear, a black bear who tries to compete with our protagonist. Many animals will participate in their adventures, but none of them speaks except for Papa Noél and his cousin Dasha, all the animals communicate with gestures, which is also very educational for the little ones. Among these animals there are Wolves, Squirrel, Hare, Hedgehogs, Chinese Panda, Tiger and Penguin. A free game for mobile is available, both for Android and for Iphone. Of course, like almost all free mobile games, incorporate advertising or "in-game" purchase options. It is a series of essential drawings. As it is most likely that your son or daughter will like it, you will be lucky enough to enjoy with them this great series instead of many others that are very tiresome. The visual quality in terms of color, quality, 3D design, ambience, lighting, etc., were already very good in the first episodes, but it is still much more noticeable in recent years. Personally, the best thing about Masha is his characteristic laugh, it is the most contagious. La Birthday invitation from Masha and the Bear is designed in high quality, 300 dpi, perfect for printing both at home with any type of printer, as well as in a printing or online printing service. If you are going to print your Invitation, we recommend that you use paper a little thicker than the typical ones that we have at home, since with this paper it would be excessively thin. If you can, get some 220gr paper in brightness (also called glossy). EYE, it is not necessary to look for it to be specific to photography since they tend to be more expensive.